As March comes to a close, we have once again celebrated the many contributions of women to society. For many of us conducting research at the Climate Science Centers and partner institutions, women who have made tremendous strides in our various scientific fields like Marie Curie, Rachel Carson and Jane Goodall, come to mind. As we reflect on the many accomplishments of these women, we wonder how the status of women in the sciences has changed over the decades, and why it matters. The dialogue for inclusion regarding gender, race, class, sexual orientation, etc., is often awkward; that which is unfamiliar often makes some people uncomfortable. The purpose of this post is not to agonize over the exclusion of diversity in the past, but to provide an overview of the causes of the gender disparity in the sciences and then discuss why gender diversity matters for academia, the climate sciences, and how we, as early career professionals, might benefit from being aware of and advocating for greater inclusion in the future. The first part of the story is an optimistic one. In the United States, women compose nearly half of the general workforce, earn more Bachelor’s degrees annually than men, and are accumulating more Ph.D.s in STEM-related fields than ever before. However, despite growing headcounts in STEM-related fields, women have yet to reach, fill, and maintain top-ranking academic positions compared to their male colleagues. For instance, science and engineering departments at elite academic institutions have few tenured women faculty. A survey of U.S. science and engineering departments in 2005 found that only 3-15% of full professors were women. A parallel trend exists outside of academia; despite a greater number of women entering the white-collar workforce, men outnumber women 4 to 1 in top executive roles. In academia, the problem appears not to be a lack of qualified doctoral candidates; women are entering the applicant pool at relatively equal rates comparatively to men. The problem is that, somewhere (or perhaps everywhere) along the way after graduation, women are falling off the career path; the pipeline is leaking and those filtering out through its’ porous seams are women with families. Studies of the topic suggest that the issue is rooted in a handful of real and persistent barriers. The imbalance of women in leadership positions has been attributed to a confluence of factors stemming from unconscious gender biases, family pressures, and a general lack of professional networks and mentors. Studies suggest that women in the sciences are subject to inadvertent, unconscious, but ever-apparent gender biases. Women consistently face bias in teaching evaluations, conference abstract submissions, tenure decisions, research citations and postdoctoral employment. For example, in one study, researchers disseminated identical resumes to science professors. Regardless of the professor’s gender, results revealed that on average, when the applicant was named John instead of Jennifer, professors viewed the applicant more favorably, and awarded an average salary of $4,000 more. The unrelenting time pressures of academia can be especially burdensome for parents, and mothers in particular. 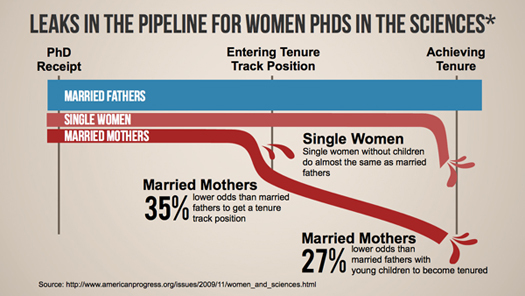 Research reveals that married women with children are 35% less likely to enter tenure track positions after receiving a Ph.D. in science than men of the same circumstances. Women with children are 27% less likely to achieve tenure than men with children. Moreover, women with children are 28% less likely to achieve tenure than women without children. The work-family balance conundrum spills over into gender bias as well, as men are viewed more favorably and committed than women when seeking to maintain a work-family balance. In conjunction with the aforementioned barriers, the environment for young women seeking to study and secure careers in STEM-related fields is lacking sufficient support. In the absence of influential and encouraging female mentors, young women lose the opportunity for role models to demonstrate and encourage career development in the face of professional and personal struggles. Research even suggests a positive correlation is present between the number of female faculty in a department and the success of young female students. Although it seems like a minor aspect, many of us can recall a mentor that was invaluable in our career development. So, why should we care about gender (and other social) underrepresentation? Beyond the fact that inequality of any form is unjust, diversity of perspectives improves outcomes. Gender is a key factor that shapes the lens through which individuals view the world and approach different situations. Research on social diversity consistently reveals that heterogeneous workforces are more innovative and productive than their homogeneous equivalents. Not only are more diverse working groups more innovative, they also tend to be more profitable. In the business sector, companies with more than one woman on the board deliver higher profits and diversity correlates positively with sales and number of customers. At the start of this post, we recognized the achievements of a few brilliant female minds and inadvertently echoed a mentality that once resonated in the sciences for decades—that of the brilliant, singular scientist. Surely, particular individuals possess rare, innate intellectual abilities. But research has shown that, more often than not, true brilliance is achieved through collaboration and ultimately, diversity of perspective. In particular, collaborative academic research teams with equally heterogeneous gender proportions have been shown to have more collective intelligence and innovation than homogeneous groups. Moreover, gender and the experiences that go along with it can influence how individuals might study and interpret science. For example, when female scientists began exploring primate social behavior, novel discoveries into both male and female behaviors were made. Increases in diversity will make us not only more equal but also more innovative and more productive. Inclusion doesn’t come without effort. People tend to work harder in more diverse working environments, merely due to the fact that thinking amidst varying perspectives can require more cognitive and emotional effort. In accepting diversity, we are promoting and fostering a culture that considers and acknowledges alternative thought that might in turn get us closer to better, more informed solutions and decisions while simultaneously cultivating the next generation of leaders in the field. Efforts to meet the challenges of climate science depend on the collective quality of future scientists. By including divergent and multiple perspectives of individual scientists, we can set ourselves up for success. In moving forward to address the sources of leakage in the pipeline, a major source of strength will stem from strong social networks needed to foster and support change. Organizations like the Association for Women in Science, National Science Foundation, the National Academies of Sciences, and the USGS Wisdom Group continue to tackle the underrepresentation of women in science. Nevertheless, there is plenty to do at the individual level; as an ECCF colleague recently noted, the small stuff actually does matter, and so does gender and diversity. If we succeed in increasing and retaining more women and underrepresented groups in the sciences it is likely that we will achieve greater benefits for both people and planet. This post was co-authored by Meaghan Guckian and Toni Lyn Morelli. Meaghan is a doctoral student at UMass Amherst studying environmental decision-making and behavior. Toni Lyn is a USGS Research Ecologist with the Department of Interior Northeast Climate Science Center. This post is a result of a thought-provoking discussion among the Northeast Climate Science Center staff and Fellows on February 17, 2016. Both men and women contributed resources and shared their impressions and proposed solutions. We have compiled related articles and resources to help frame and foster future discussions and hope that others will consider incorporating this topic during relevant trainings, meetings and conferences.